The Serpent Ventilated Hard Hat CoolSense Air flow system lets heat escape, keeping workers cooler and therefore promoting compliance. 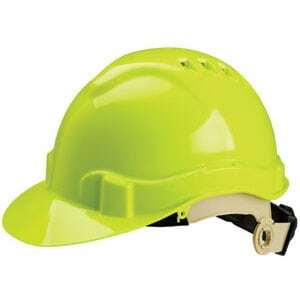 Snake-head shell design provides attractive style, while offering extremely durable head protection. Manufactured from a high-density polyethylene material that’s incredibly lightweight – just 13.1 ounces. CoolSense Air flow system lets heat escape, keeping workers cooler and therefore promoting compliance. Soft, six-point nylon suspension is comfortable yet provides exceptional impact absorption. Available with a pin-lock or ratchet suspension, which adjusts to fit 6 5/8 – 8 ¼ head sizes. Soft cushioned brow pad helps absorb moisture. Rain trough helps keep rain off workers. Complies with ANSI standard for Type I, Class C only.